Facebook is building its new data center in the very anti-LGBTQ state of Alabama. What does this mean for LGBTQ rights? What does it mean for Facebook? But what’s a supposedly progressive, LGBTQ-friendly company like Facebook doing, giving millions of dollars to an anti-LGBTQ state like Alabama? Alabama does not prohibit discrimination based on sexual orientation in housing, employment, credit, or public accommodations. The state has no hate crimes law. No state law addresses anti-LGBTQ bullying in schools. The state doesn’t ban insurance exclusions for transgender health care, nor does it have transgender-inclusive health benefits for state workers. In fact, Alabama has recently passed anti-LGBTQ legislation. Governor Ivey signed a law to allow faith-based organizations to refuse to place children with LGBTQ parents on religious grounds. The state Senate passed a bill doing away with marriage licenses, to spite LGBTQ couples. Compare this to the question of where to place Amazon’s new headquarters. Several cities are being considered as possible locations. There has been a considerable push to ensure that LGBTQ inclusion is a deciding factor in where it goes, and disqualify cities in states without LGBTQ protections. That’s why Indianapolis has probably lost their chance after state Republicans keep attacking LGBTQ people. 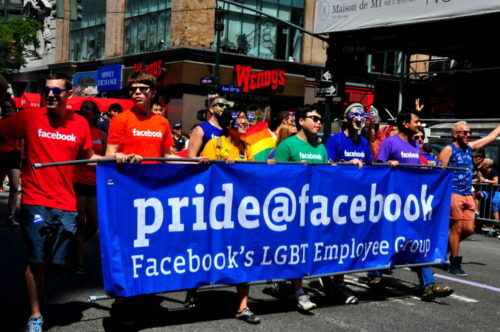 Large companies with diverse workforces, like Facebook and Amazon, have an apparent interest in doing, and perhaps even an obligation to do business with states where their LGBTQ employees are protected. If they want to retain and attract talented employees, it’s just good business sense. Most likely, Facebook employees will have to work at that data center without protections against discrimination and harassment. Maybe Alabama and Facebook gain something from this decision, but LGBTQ workers still lose.